The Campaign Against Living Miserably (CALM) launched in 2006 and is leading a movement against male suicide – the single biggest killer of men under 45 in the UK. CALM is committed to tackling suicide as a national priority, to destigmatise it and accelerate and elevate the prevention work which saves and changes lives. CALM’s #Project84 campaign launched in March galvanised public awareness around the fact that 84 men a week lose their lives to suicide in the UK. The stats are devastating enough without considering the monumental impact suicide has on the lives of the families of Britons who cope with the loss every day. On World Mental Health Day in October, the charity secured a monumental win with the appointment of the UK’s first Minister for Suicide Prevention. To throw their weight behind this vital work, UKTV’s Dave teamed up with CALM for a coffee cup advertising campaign in Coffee Shops across the UK. The message is clear – talking about it is often the first step to helping someone feel less alone and supported when things are tough. Men are renowned for keeping things to themselves which can often lead to a feeling of isolation and despair. 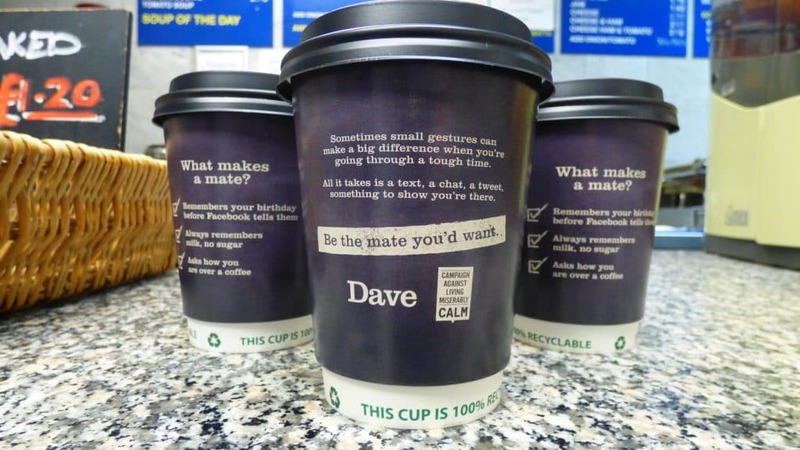 Dave and CALM have used branded coffee cups as a mechanism to actively encourage the public to talk, but more importantly for friends, family and colleagues to be conscious of the little things and if someone they know looks like they need to talk or they’re going through a tough time, to take them out for a coffee and a chat. Messages delivered in a relevant way, at a relevant time and place are known to be far more impactful making this an especially resonant campaign. Particularly when 1 in 2 takeaway coffee cups ends up on a desk in the office, spreading the word beyond the coffee realm.